by Jane Goodall, Gary McAvoy, Gail Hudson | Nonfiction | This book has not been rated. Placing this book in one of Bookcrossing's book categories gives me some trouble. Is it "Cooking, food & Wine"? Is it "Health, mind & Body"? or is it "Environment, and how to save it"? The last one is actually missing from the categories list, but this book shows how all three are related. The powerful food industry and agrobusiness is poisening us, our children, and our land and seas, and has so much power it succeeds most of the time to conceal this fact from us. Jane Goodall is trying to make us aware of this, and showing us how we can stop it. 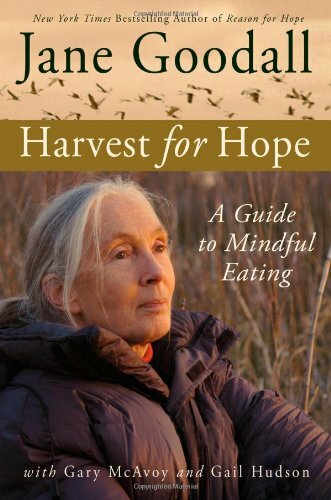 Her book can be compared with "Not on the label" by Francesca Lawrence, since it deals with mostly the same issues - from intensive farming and the meat industry, to the terrible pollution involved in salmon and tiger prawn farming, but it gives much more of an inspiring insight in the alternatives. I love this book. It should be read by anyone who eats. This copy is special to me, since Jane brought it for me when she came to Holland. I finished it this morning, so I am giving it to Niana, as promised. We might link it up to one of the "Not on the label"-links afterwards. It returned back to me.